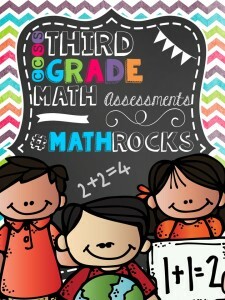 Home » Uncategorized » Third Grade Common Core Math Assessments – All Common Core Math Standards! Third Grade Common Core Math Assessments – All Common Core Math Standards! Grades: 3rd (could enrich 2nd graders or be used as progress monitoring RTI for 4th graders). Check it out in my store by clicking the picture above! Are you tired of searching all over the internet to find quality math assessments that are not only aligned to the Common Core, but can also be used as a progress monitoring tool or an enrichment tool? Well then search no more, because this is the set of assessments for you! These assessments are aligned for the 3rd grade common core, but can also be used to review 4th grade math concepts and to enrich 2nd graders. These are quality assessments that will help you determine if your students have achieved mastery of a particular standard and these assessments will help you differentiate your math instruction too! The progress monitoring graphs included will allow you to keep data on your students progress and you can even manage tier 1 interventions if you use the RTI (response to intervention) model. Answer keys are provided in this product along with two quality assessments for each math standard in third grade.